SAIPUA: And don't forget to devour your flower. And don't forget to devour your flower. While Sarah is out traversing the wild Down Under, I have had a bit more time on my hands. I have since tried my hand at a singing career - in my basement - I didn't want to cause anyone bodily harm so I felt it was best to buffer that audition under at least one floor of wood and brick, but after the neighbor stopped by to see if the screeching could come to a hault I figured I should stick to what I'm good at and leave the singing career for my fellow associate in crime - Asheley. If you haven't already guessed Deanna is reporting here. Ever since I was a wee lass I have been obsessed with film, I once traveled very far away to garner myself a newly fandangled master's in film theory, and since then I have made it a life goal to keep up with the obsession through shhhhhh.... a secret blog no one knows of. SO here lies my big break. Jodorowsky... Alejandro Jodorowsky. The first film I ever saw by Alejandro was Fando y Lis (1968). The film made me a little uncomfortable in my own skin, i felt dizzied, abandoned, loved, and cast away, by the end I had cried a few times over. It was then that I discovered the gravity of surrealism, because for me this work caused a schizophrenic fissure. I felt so many different emotions that they seemed to topple over one another, I could barely recognize when one feeling had fled and the next had developed and nourished itself. 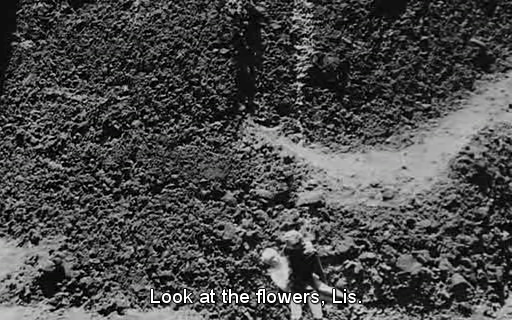 The opening scene to the film shows Lis lying on her bed, garden rose in hand as she begins to nibble on the specimen, in the background explosions and sirens can be heard yet she's seems completely unaffected by such noises, she just continues devouring the flower till the very last bite. Jodorowsky's film is based on a play of the same name by Fernando Arrabal, and if I could sum up the plot... The war of all wars has taken place leaving the stragglers behind to find solace in an apocalyptic wasteland filled with rubble, crumbling structures, bourgeois partygoers, prostitutes, transvestites, vagrants, mud people, and memories of the past - all of which Fando and Lis encounter. Fando is impotent and Lis is a parapalegic, and in this wasteland Fando pushes Lis around on a cart complete with a giant gramophone, yet he frequently finds himself tempted to leave her. 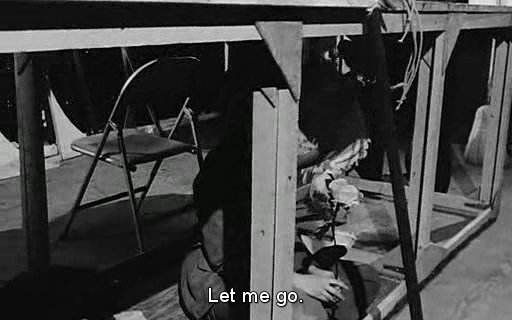 In several scenes he does exactly this, leaving her to fend for herself as he indulges the characters they meet along the way, only to realize that the influences of the terrain - the disrobing prostitutes, the naked mud people caressing themselves - may not even exist, leaving Lis as his only proof of truthful existence of which he continuously returns to. They are searching for the great city of Tar, where people live in happiness and all dreams come true, but does this grand city even exist? As the film progresses you begin to understand that Tar is a mythic city, a city that exists if you want it to exist, a place that you will find if you want to find it. During their journey Lis is reminded of her childhood, a specific moment in time where she was abused, in this moment of recalled memory a child sits still under a table holding a single garden rose, similar to the one Lis consumes in the beginning. This rose is her innocence, and I believe Jodorowsky included this rose to symbolically impart that her innocence was devoured. Fando becomes increasingly frustrated having to cart Lis around in search of something they can't seem to find. Though he states several times that he loves Lis, and fantasizes about their future life in the city of Tar, he begins to treat Lis with less respect, eventually causing her much anxiety. Fando wants to believe so fervently that Tar will appear that he imagines flowers growing throughout the terrain, the flowers are the prospect of life and beauty. For a moment they seem happy, but as he asks Lis to look at all the flowers she doesn't catch on quick enough, she doesn't see them, and he can't stand that she doesn't see them the way he does. 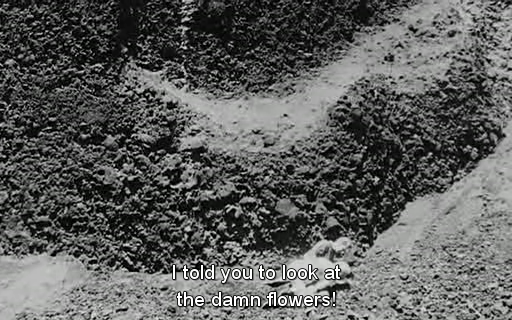 Fando's frustration explodes as he grabs Lis by the feet and drags her down a rocky path, the rubble scrapes her back and while she wails and moans, he screams at her for not seeing the flowers. 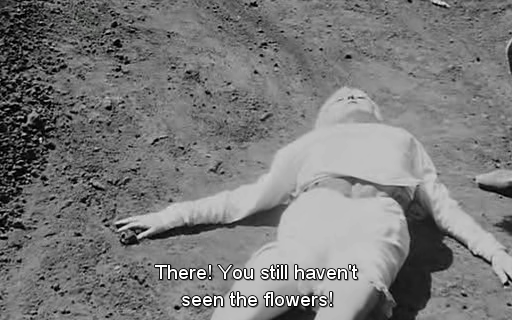 Regardless of her many attempts to prove that she can see all the flowers, he knows she never saw them from the beginning. This marks a pivotal change for Fando in the film, showing just how nasty he can be both concerning his own personal turmoil being stuck with Lis, and the search for an imaginary land of fruitfulness that doesn't seem to present itself, no matter how far they travel. I don't like spoiling an ending so I can only hope that I have provided enough fuel and intrigue for your own personal viewing. I will however forewarn that this film is not for everyone, it is a challenge, it is a masterpiece in its own, and it might conjure some feelings of illness, remorse, loss, abandonment, frustration, an abounding imagination and the quest for some place greater than ourselves - A place such as Tar. A place to come home to that makes all the worry and concern melt away. When I think of all that one could possibly encounter in life, I take a moment to lay down in contemplation and devour the flower. Except my flower is a hellebore. If it wasn't for the childish scrawl I would say that could be written by a very eloquent adult. Well done Peanut.